2017 was a remarkable year for investors and cryptocurrency enthusiasts around the world. The overall growth in the market capital of cryptocurrencies skyrocketed to 810% by the month of August in a year. It means that it reached from a tiny $17.7 billion to a whopping $161 billion in just eight months. This is the amount of profit that would have taken decades for the S&P 500 stock market. So there’s no doubt that if you had invested in any top 10 cryptocurrency by performance eight months ago, you would have made a jaw dropping profit. With Bitcoin gaining a 375% and Ether 4,300%, you can imagine the amount you could have transferred to your bank account. The most popular and with largest market capital, Bitcoin is the top scorer when it comes to performance. Bitcoin rose and gained a tremendous 380% growth within 2017. It is just a decade old asset that is the biggest cryptocurrency by market capitalization. Bitcoin not only possesses the most admired reputation but also has a very well established user and fan base in the world. There’re many organisations which have stepped ahead and started taking Bitcoin as a payment. However, there’s still time in getting it declared as a legal tender. Though it hasn’t been long since Ether came to existence for the first time, however, within the two year span from 2015, it has succeeded to capture the second position among all the cryptocurrencies. Ethereum has lifted the growth bar upto 4,279%, which is from $8 on January 1st, 2017 to $400 by the year end. So if you had invested $100 on Jan 1st’17 you would’ve made $5000 by now. Ripple doesn’t have any physical or metaphysical representation, which makes it strange as it secures third position in the top 10 cryptocurrency list by performance in 2017. Ripple is more of a currency interchange application, which isn’t directly accepted or exchanged against any goods or services. Litecoin was tailing Bitcoin until Ethereum came into picture. There’s no doubt that Ethereum stole its thunder and pushed it to fourth position. However, Litecoin has years long reputation and functionality behind it, which has helped it to have a place among the cryptocurrencies that performed the best in 2017. The acceptance of Litecoin as a currency is widespread among many online shops and websites. NEM is not an old digital currency and was introduced in March 2015. NEM has a dedicated following, which mines day and night with a goal to expand its following and base. However, these efforts have not been paid well enough and the market value for NEM remains the lowest. The low price per unit is expected to outperform the market capital of its competitors. Also Read: Blockchain: Terrorist Agency or Deterrent? With its high levels of user anonymity and operational functionality of the alternative currency field, Dash has intelligently featured a few leading innovations. Dash was originally intended to be a digital cash, but the developers kept the improvements and made it through to become the sixth best performing cryptocurrency in 2017. IOTA was never this famous before 2017. but the users and developers have claimed that IOTA will be the backbone of Machine Economy. The best thing about IOTA is that its Tangle ledger works for free. The updation of settling transactions doesn’t cost you anything, unlike other ledgers. The revolutionary innovation for IOTA is also that it’s ledger is blockless and scalable. Monero is considered the safest cryptocurrency that has an additional layer of privacy protection for its users. Monero had 14 billion units flowing in the circulation as of mid 2017, The success of Monero is driven by the privacy offered with coin mining operations. Stellar was introduced in 2014 and has been growing since that day. 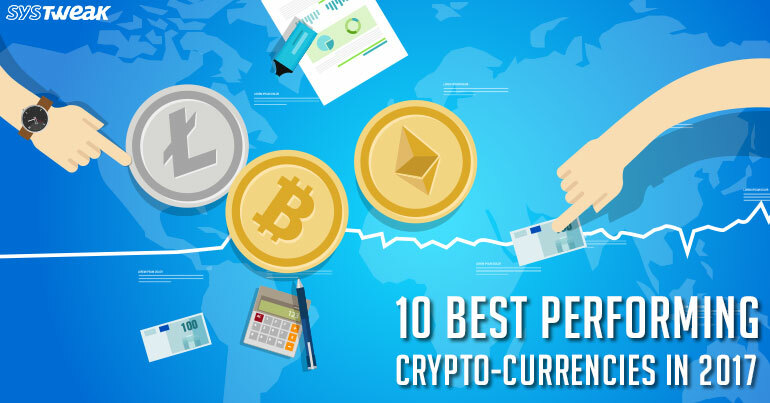 It is confirmed whether Stellar captures the ninth position among the top 10 best cryptocurrencies by performance but it is worth mentioning. Stellar has a rival known as ByteCoin, but the value per unit is better than its rival. NXT is a boon in cryptocurrency and there’ll be no doubt if it becomes one of the biggest cryptocurrencies by market capitalization in future. The transaction processing speed of NXT is near to the legendary Visa and Master. Not only the speed but also the level of security provided by NXT is way ahead than its rivals. Overall, cryptocurrency market is booming with above digital money over the world. If you’re an investor, choose the right one based on the previous growth rate and success. Make sure you study well before investing, as cryptocurrencies haven’t been declared legal tenders.